Strawberries are sucking me in. They’re red and shiny and cheap. I keep buying them. Yet they’re often a little disappointing, and the kids are over them anyway like the fickle butterflies that they are. It’s very sad watching a punned of strawberries grow little beards and gently disintegrate on the kitchen bench top. One solution would be to stop buying the wretched things, but my peasant genes keep shouting Fruit! Cheap! Buy it!. There’s a plethora of lemon recipes out there, but very few for strawberries that aren’t just chop them up and place them decoratively on top of something that doesn’t actually contain strawberries. I have made a strawberry lemonade, which I may share with you one day when I’ve run out of other housewifery things to blog about. I really want to make them into muffins, and as you’ve been following me like a bloodhound, you’ll know I’ve had a stab at a recipe that was fairly unsuccessful. 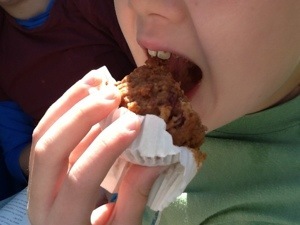 They were quite nice, light and tangy, but the kids object to bits in their baked goods. This means cooking the strawberries first. Take a punnet of strawberries, chop them up, bung them in a saucepan over low heat, put the lid on and leave them. My pots are fancy non stick ones, so if you’re worried about sticking, you could whack a small amount of butter in there too. After about half an hour you should be able to mash them up with a wooden spoon. I got about a cup of cooked strawberry mush. Next I need a muffin recipe that has a wet component in it. For their own inexplicable reasons, Americans regard the pumpkin as a fruit you should shove into all kinds of baked goods. Sounds gross to me, but it does mean there are a few pumpkin muffin recipes out there. I found a likely one, and changed it completely. Here’s what I did. Beat together 2 eggs, 1/2 cup vegetable oil, 1/2 cup of brown sugar because I think it tastes more interesting than white, and 1/3 cup of wheat germ because I’d like to pretend this is a healthy recipe. Also, I like wheat germ. Add the strawberry mush. If you can’t be bothered waiting for it to cool down, the stuff will start cooking, so work fast with the rest of it. Stir in 1 1/2 cups of plain flour, 1 teaspoon of baking powder and 1 teaspoon of bicarbonate of soda. Mix until smooth, but don’t beat it because you just don’t do that with muffins, they don’t like it. Spoon the mixture into a greased twelve unit muffin tray. Actually, I put them in paper muffin cups, because I hate washing up muffin trays. Bake at 180 degrees for about fifteen minutes. They came out pretty well, kids were initially concerned about the brown colour, but that was from the brown sugar. They haven’t all been eaten yet, and are still pretty good after three days. I think next time I’ll put in a teaspoon of vanilla, and possibly a touch more sugar.